TSE has been an entertainment booking agency since 1975. Since that time, it has undergone many adjustments as the entertainment booking industry itself changed. From state entertainment booking agency licensing requirements to adapting to other music booking and consumer trends, TSE has adapted. You can learn more about state by state entertainment booking agency licensing requirement at the North American Performing Arts Managers and Agents Legal page. Of course, the biggest change was when Texas Sounds Entertainment became TSE Entertainment. With the name change and re-branding came a host of changes, many of which have been spelled out in an earlier post. The biggest changes were to increase the footprint of the booking agency and the services it provides. TSE is no longer just an entertainment booking agency. Today TSE Entertainment is a full-service entertainment agency that provides a wealth of services that go beyond entertainment booking. 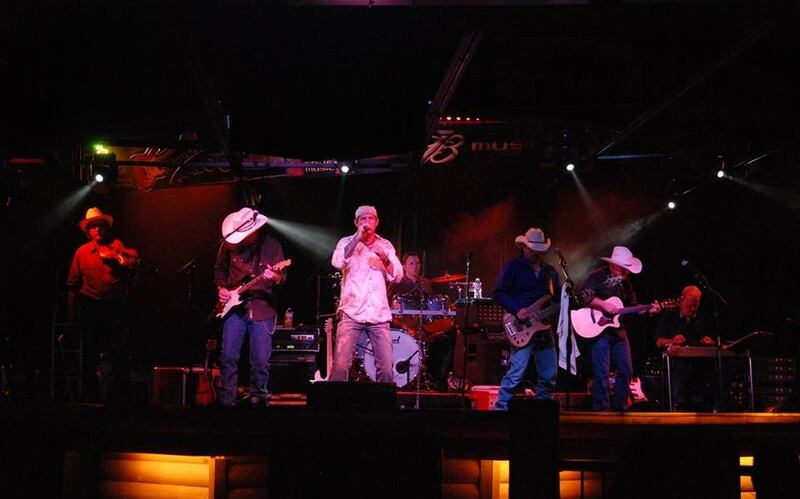 TSE has its own roster of featured country music artists, tribute acts, Latin artists and party bands. These rosters, coupled with its ability to book world-renown entertainers, make TSE a major music booking agency. Because TSE is such a respected entertainment booking agency its other services are often overlooked. After all, TSE has been booking entertainment since 1975. Not only is it a music booking agency, but it also provides turn-key concert production services. For those clients who are new to concert production, TSE’s services are extremely valuable. 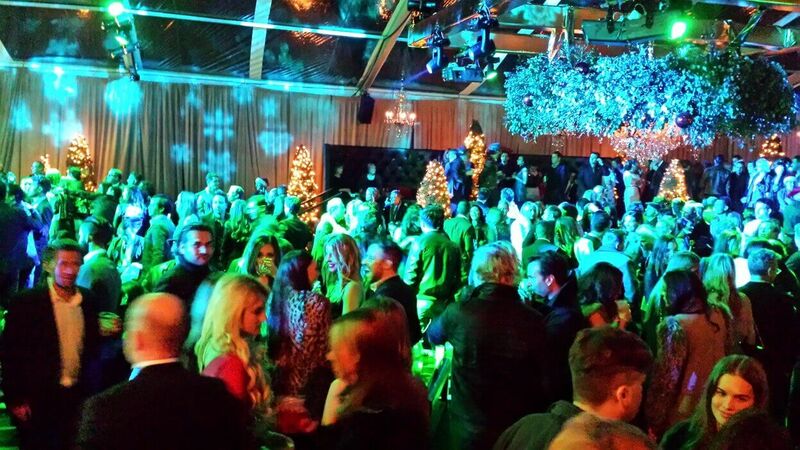 TSE contributes what is missing to a client’s resources to produce and promote their event. Our staff members become part of their concert production and promotion team. 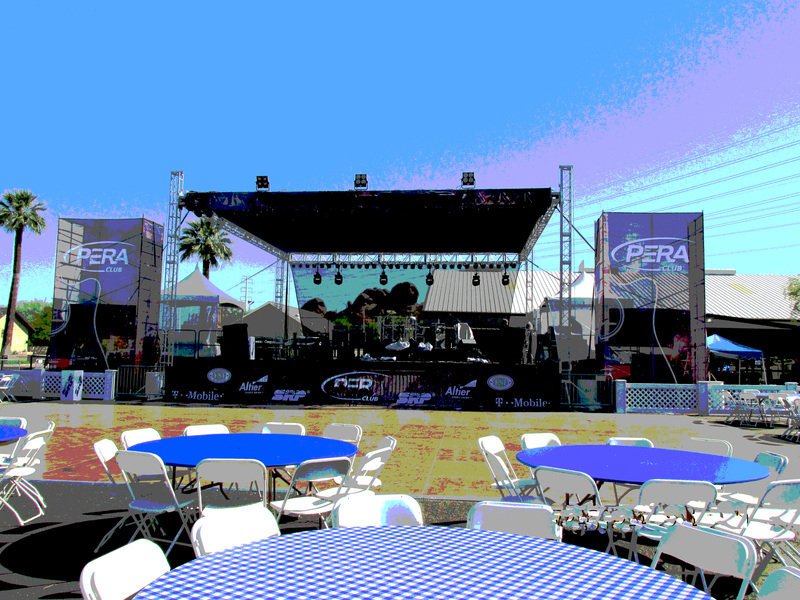 That allows the client putting on the event to use only the services necessary to achieve their concert goals. 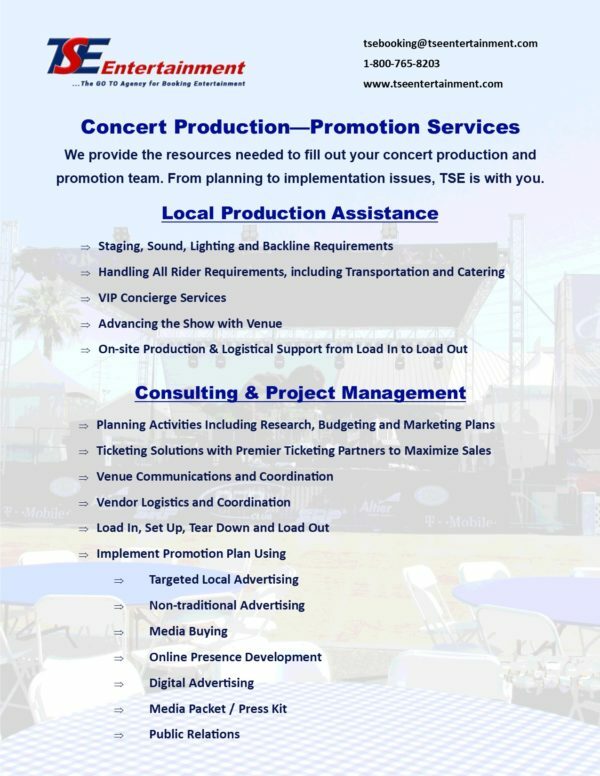 From planning to load out, TSE helps concert producers and promoters with whatever production and promotion services they need. What we do for concerts, we also do for entertainers on tour. There are a lot of moving parts to putting on a concert. Most entertainment booking agencies confine their services to booking and contract negotiation. If you need help with concert promotion or production, you need to turn to another type of entertainment agency that provides these services. With TSE, you can use any or all the concert booking, production and promotion services you need to fill out your own resources. That makes us a boutique entertainment booking, production and promotion agency. Unlike the big guys who take over your event, we provide just the level of services that you need, no more, no less. Now imagine all the meetings, phone calls, emails, texts that are needed to assure a smoothly run show from pre-planning, promotion to the performance itself. Do you really want to do that? Let’s look at the services that go beyond being just an entertainment booking agency. TSE staff will help the primary producer or promoter with overall planning for their concert or tour event. This can include building business or marketing plans as well as concert or tour budgets. 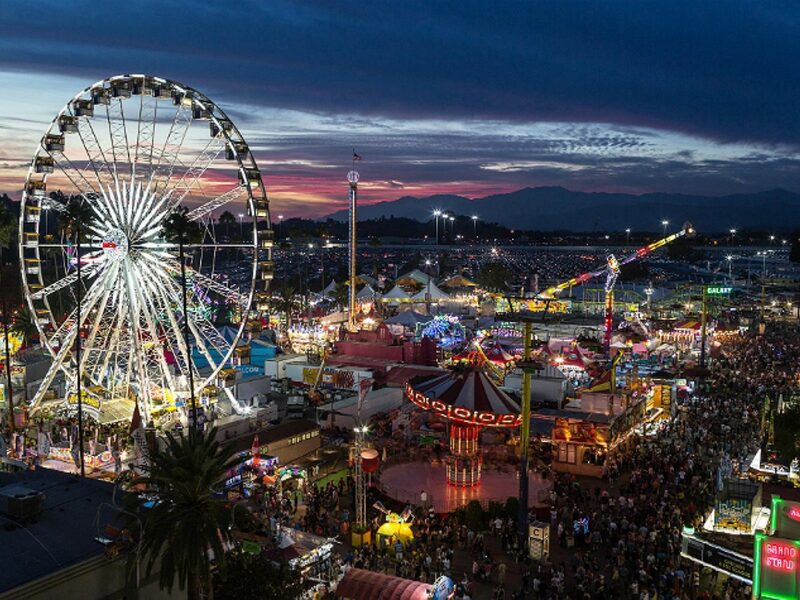 TSE can research potential audience demographics; costs for performers, local production and ancillary service vendors and other products needed for the event or tour. 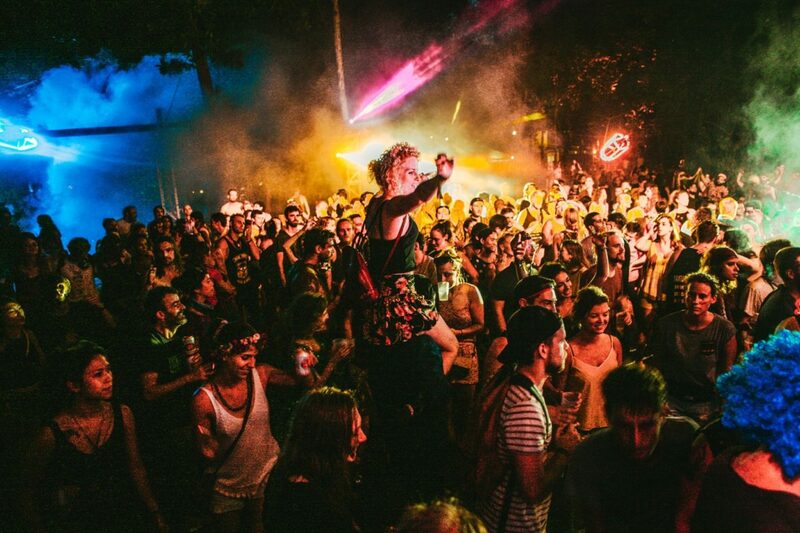 Our services in this case are as a consultant to the concert promoter or producer. The hardest concert to produce are outdoor concerts and first-time concerts. Merge these two scenarios and it’s easy to see why someone may need various forms of help to put on a successful concert. TSE offers a comprehensive set of concert production services. Whether it’s providing staging. Lighting or sound equipment all the way to Porta Potties and ticketing, TSE does whatever is needed by our clients to achieve a successful concert or tour. Providing on-site production and logistical support staff during load in, sound check, performance and load out. For a full listing of our concert support services see our Concert Production Services Page. Handling all vendor selection, negotiation, logistics and coordination. Handling other products and services needed by client. As you read the above you can easily see that TSE is more than an entertainment booking agency. It’s a comprehensive concert or tour booking, production and promotion agency. We offer a “soup to nuts” range of services. You can visit our Concert – Tour Promotion Page for more information as well. Let us give you peace of mind, knowing that your gig is being run by a professional entertainment agency that has been doing it for over four decades. Let our four plus decades of experience and knowledge work for you. You will learn firsthand that TSE stands behind its services both as an entertainment booking agency, but also as a full-service concert production and promotion agency as well. As with anything we do, we will commit to excellence and the development of long-term relationships built on trust and transparency. Email us or give us a call to discuss your entertainment booking, concert production or concert promotion needs.